But he is conscious of the new generation of 40-somethings breathing down his neck. “It’s nice to finish with a win,” he said. “I’ve got my snooker mojo back. I’ve been practising things and they’re now happening. “I’ve had probably my best season but I’m under no illusions, I’ve got to keep working hard. 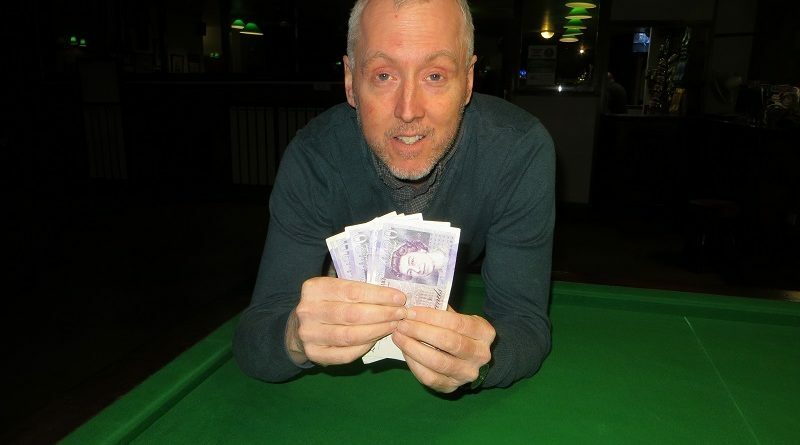 Hunter pocketed £100 prize money after overcoming first-time finalist Darren Johnson 2-0. He secured both frames on the colours but was pushed all the way by the 48-year-old from Petersfield, whose ability to lay an absolute corker of a snooker put Hunter into all sorts of trouble. Meanwhile, home player Paul Burt made his first semi-final appearance for eight years. Burt lost 2-0 to Hunter but has now taken the lead in the Masters (55+) rankings. In the second semi, Alan Harvey (Staines), on his first Cuestars outing for three years, went down 2-0 to Johnson. The 23 runners for the event sponsored by Dransfields returned 22 breaks of 40 or more. Nick Birney (High Wycombe) posted the highest of 98 in a 2-1 defeat by Mike Quinnell (Bexley) in his first group-stage match. All eyes now turn to the Seniors Championship at The Crucible Sports & Social Club, Newbury, on Sunday, April 28, where the top-20 ranked players will battle it out for £500 prize money. The eighth and final leg at Cue T’s Social & Snooker Lounge, Marchwood, on Sunday, April 14, will be the last chance to secure a top-20 spot. Dan Hammond, James Height, Andrew Darken, Herman Desmier, Dean Sycamore and Steve Ashton are all within 12 points of Neil Herd in 20th place. Nick Birney: 98, 66, 45. Simon Dent: 50, 46, 41. GROUP A: 1st, John Hunter (Salisbury SC); 2nd, Alan Harvey (Staines); 3rd, Wayne Muddiman (Chandlers Ford Central Club); 4th, Carl Davies (St James Institute, Bournemouth); 5th, James Height (Break N Dish, Street). GROUP B: 1st, Darren Johnson (Petersfield Bowls & Snooker Club); 2nd, Martin Wallace (Crucible, Newbury); 3rd, Simon Dent (Castle Club, Brighton); 4th, Andrew Darken (Chertsey SSNR Club); 5th, Stephen Hills (Traders, Northfleet). Garry Coulson (Bournemouth) withdrew. GROUP C: 1st, Nick Birney (Liberal Club, High Wycombe); 2nd, Neil Craycraft (Jesters, Swindon); 3rd, Mike Quinnell (Old Bexley Ex-Servicemen’s Club); 4th, Steve Ashton (Salisbury SC); 5th, Neil Carroll (Chandlers Ford SC); 6th, Richard Arnold (Salisbury SC). GROUP D: 1st, Paul Burt (Salisbury SC); 2nd, John Monckton (Woking SC); 3rd, Lawrence Millington (St James Institute, Bournemouth); 4th, Pat Patel (Crucible, Newbury); 5th, Phil Vowels (West Byfleet Social Club); 6th, George Apperley (Newbury). QUARTER-FINALS (12 pts, £15): Hunter 2-1 Craycraft, Burt 2-0 Wallace, Johnson 2-0 Monckton, Harvey 2-0 Birney. SEMI-FINALS (15 pts, £35): Hunter 2-0 Burt, Johnson 2-1 Harvey. FINAL (25/18 pts, £100/£60): Hunter 2-0 Johnson.